I have to admit I’ve always been a stressed out, anxious person. It’s in my nature to worry about everything, and sometimes this worry is completely overwhelming and all-consuming. Coupled with chronic pain, my anxiety can spiral out of control. Being in pain almost constantly is physically exhausting, and can really affect you mentally. When I was younger I acted as if my cerebral palsy and Scheuermann’s didn’t exist. I think this was my ‘coping strategy’, but of course I wasn’t really coping with anything at all, I was just denying the existence of my medical conditions. Since moving to university I’ve recognised this, and during the past year or so I decided I needed to really work out a way of coping with the pain and stress that comes along with chronic medical conditions. I cannot emphasise how extremely important it is to have rest days and to relax your body and mind if you’re dealing with a health condition such as cerebral palsy. Even if you’re not living with a chronic medical condition, you still need to give yourself time out to truly relax and to forget the worries in your life. When I was younger I thought it was perfectly fine to be completely wiped out from exhaustion after a day shopping, or to be in agonising pain after sitting to eat a meal in a restaurant. Yes, it’s normal for me to be in pain, but my body needs time to recuperate and get back to its normal self. There’s a few ways I do this, and I thought it would be a useful thing to share with you all. I also love the heat packs that you heat in the microwave. 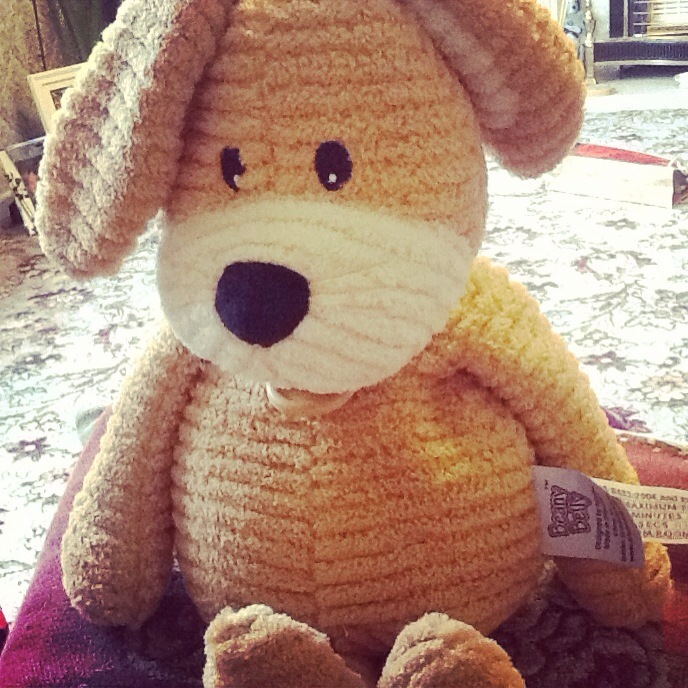 I own a particularly cute one in the shape of a cuddly rabbit! These are relatively cheap compared to the homedics range, and can really help on sore days. Having hot baths with some pamper goodies can really help me out, too. The Body Shop stock some gorgeous products and you can always find lots of voucher and discount codes online if you type in ‘body shop codes’ into your search engine. Using high quality pamper goodies doesn’t always have to break the bank, so stock up if there’s a particularly good offer on. Recently my boyfriend purchased £40 worth of products for £20, which is an absolute bargain! I also love candles. When I’m needing a rest day, I’ll get some reading together and spend the whole day in bed, taking painkillers as and when I need to. Putting a few candles on can really create a lovely soothing atmosphere. 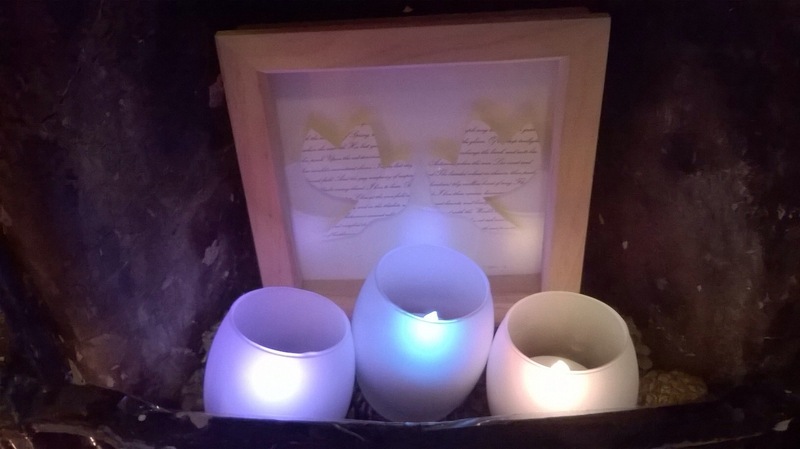 I also love my mooncandles, which are flameless and battery operated. You can change the colours of the ‘candles’ using the remote they come with, and they’re really very pretty. I purchased mine from Tesco. You can also purchase them online. I apologise for the picture, but it’s very difficult to capture just how pretty they are on camera! Having de-caffeinated drinks is a must when I’m feeling anxious or in a lot of pain. Though I thoroughly enjoy coffee and tea, I find herbal teas are particularly soothing on a stressful, painful day. I love Twinings Camomile and Honey, or the Twinings Peppermint Infusion. 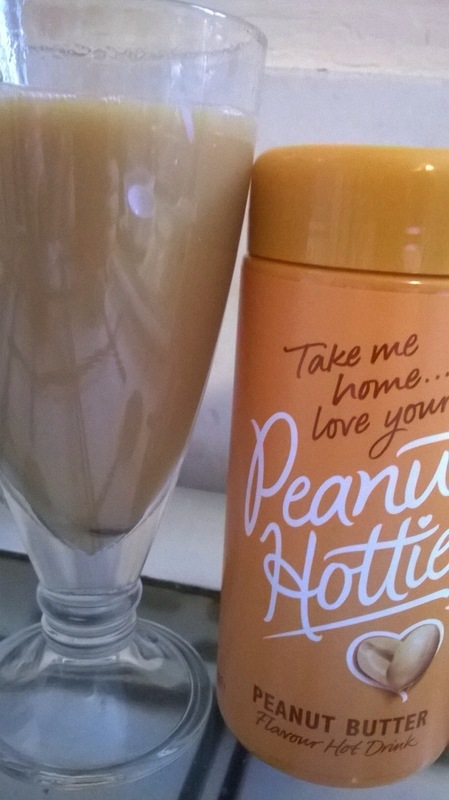 I was also introduced to Peanut Hottie at the Hull bloggers meet, and this is becoming a firm favourite. If you’re a fan of peanut butter, I suggest you give it a go! For my 21st birthday, I was spoilt rotten by all my wonderful family and friends. 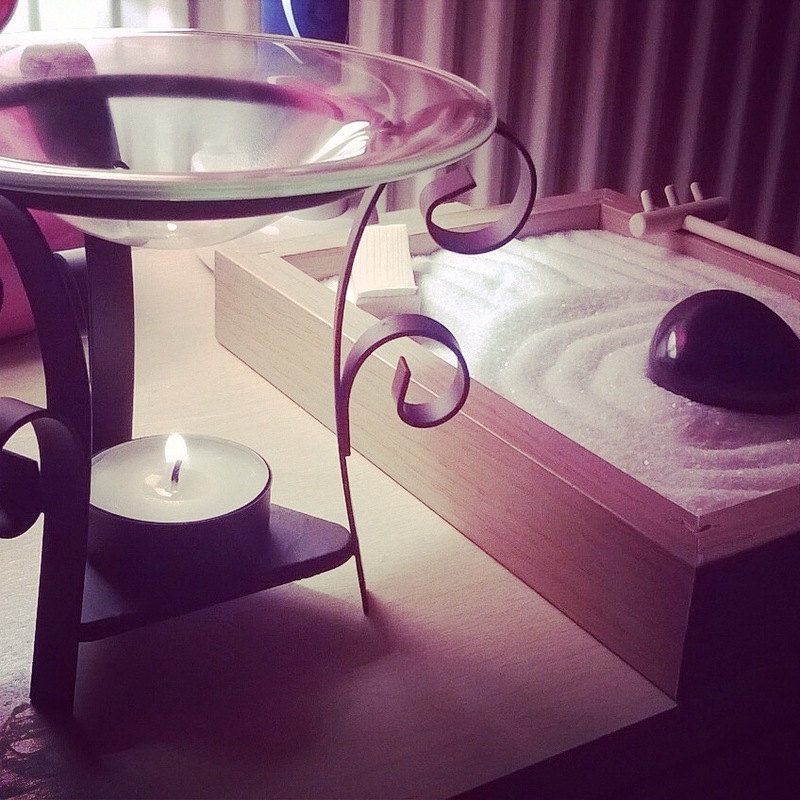 My boyfriend did make me a desk top zen garden as one of my gifts, and I’ve found it a really lovely way to relax. I wouldn’t say I’m particularly into the concept of zen or Buddhism, but raking the sand whilst stressed is a great way to relax yourself. Plus, it makes for a very unique object and you can create lovely works of ‘art’ in the sand with a mini rake. Zen gardens are available to purchase ready made online, however my boyfriend made this out of a photo frame. He glued the glass into the frame and turned the frame over. All he had to do then was buy the sand and objects to go into the zen garden, and he let me assemble it myself. It’s such a thoughtful gift, and it’s a true pleasure to own it. For secret Santa, my housemate thoughtfully bought me an oil burner with a selection of essential oils. This is such a fantastic gift for me and the essential oils create a soothing atmosphere in my room. Alongside my zen garden, it creates my very own relaxing space, and it’s really great! Buying a bouquet of flowers or a plant for my room instantly brightens up the place and so makes me feel more relaxed. I loved these gorgeous yellow roses. 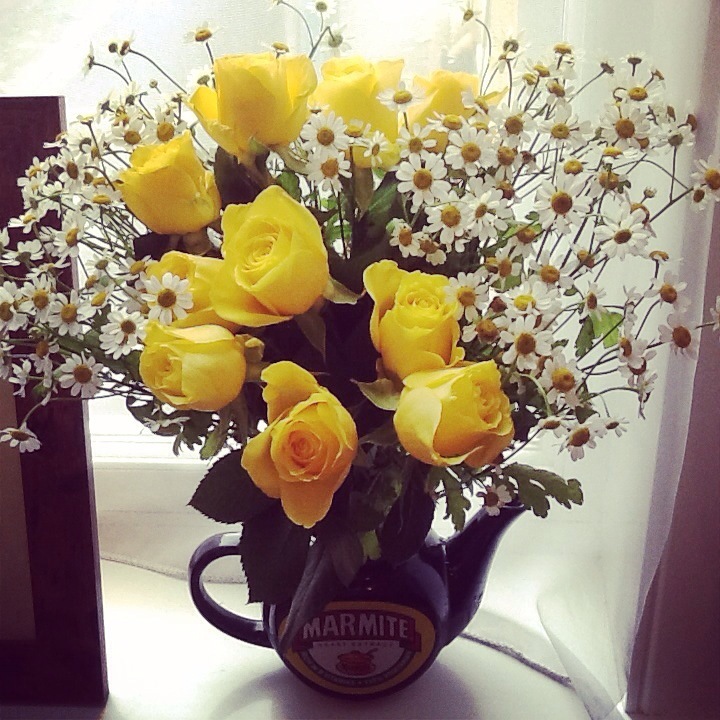 I arranged them in my marmite tea pot, and I thought they looked really lovely. I hope I’ve given you some inspiration. Hopefully in no time you’ll have a relaxing place of your very own!